Lemon Balm is the Bomb! 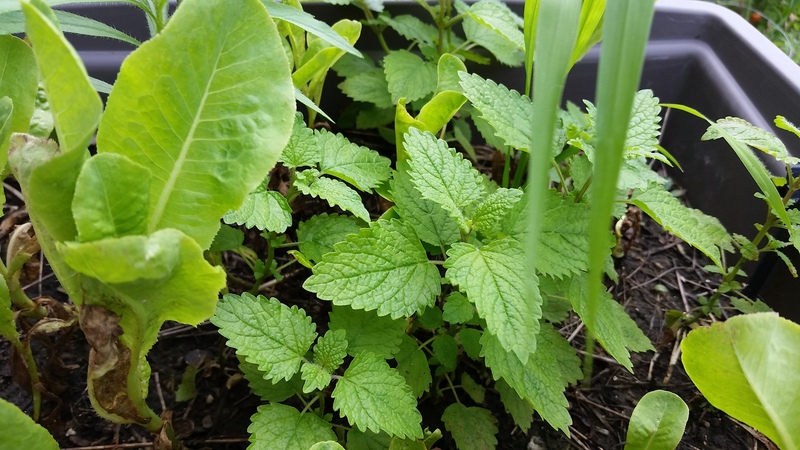 Last year, we planted lemon balm in a container on the deck. I’m not sure why. We may have picked it up accidentally during a “10 packs for a penny” seed sale and planted it to attract bees to the kitchen garden. It never made an appearance. Actually, I’d forgotten all about it and planted lettuce in the same container. The lettuce came up fast, but just as quickly bolted with the heat. I didn’t pay much of attention to the container after that. Then, I noticed that something was growing in between the bolted lettuce. At first, I thought it was a weed. When I looked closer, I realized that it looked more like a mint of some sort. I pulled a leaf, crushed it and gave it a whiff. It smells great so I could dry it and use it in potpourri. I could mix in bee balm and mint leaves and make a tea. Or, I could leave it where it is, watch it grow and enjoy the subtle citrus scent.